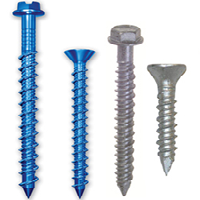 Trubolt+® Wedge anchors consist of a high-strength threaded stud body, expansion clip, nut and washer. Anchor bodies are made of plated carbon steel. The Hammer-Set one-piece zinc plated steel anchor consists of an expansion body and expander drive pin.